The film was screened at the Nizami Cinema Center on December 19, Trend Life reported. The film was shot by DIWI TV Company (Russia) by order of the Azerbaijani Ministry of Culture in accordance with the decree of President Ilham Aliyev on the 100th anniversary of the outstanding national composer. 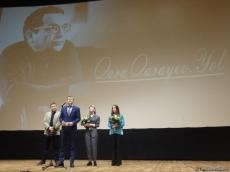 In his speech, actor of the Azerbaijan State Russian Drama Theater Oleg Amirbekov stressed that during the whole 2018 the 100th anniversary of the outstanding Azerbaijani composer, People’s Artist of the USSR Gara Garayev was widely celebrated throughout the world. The jubilee events were held not only in Azerbaijan, but also in other countries including U.S., France, Germany, Russia, Turkey, Austria, Romania, Poland, Hungary, Sweden, Ukraine, Kazakhstan, Kyrgyzstan and Uzbekistan. Throughout 2018, the music of Gara Garayev sounded on the most prestigious French music channel Mezzo and received favorable reviews from the world music community. It was noted that the premiere of the film "Gara Garayev. Life Path" was held on the Russian TV channel Culture in November. Then the film crew of the documentary was invited to the stage - scriptwriter was Nina Smirnova, operator-director - Dmitry Novoselov, executive producer - Dmitry Dulov and producer - Vera Ilyina. "We all felt a great responsibility all the time. We want to thank the creators of documentary films about Gara Garayev who were shot before us, and fragments of which were included in the film "Gara Garayev. Life Path", especially the director of the remarkable documentary "This is the truth" Oktay Mirgasimov", said Dulov. He also stressed that the work on the film was not easy. "But I truly believe that it is impossible to create something really great and meaningful without challenges and Gara Garayev often told it," he added. As the scriptwriter Nina Smirnova noted, while working on the film, the film crew met a lot of people. "Our heroes talked about Gara Garayev, and spoke only words of admiration. Before working on the film, I knew about Gara Garayeva's creativity, because I have a musical education, and being a student, I studied the creativity of Gara Garayeva," said Smirnova. The film "Gara Garayev. Life Path" includes the memoirs of the composer himself, as well as interviews of his students, colleagues and relatives. The film is directed by Andrey Sudzilovskiy. The documentary features Azerbaijani Ambassador to Russia, People’s Artist of Azerbaijan Polad Bulbuloglu, People’s Artist of the USSR Tahir Salahov, Chairman of the Azerbaijan Union of Composers, People’s Artist of Azerbaijan Firangiz Alizade, Polish composer, pianist Krzysztof Meyer, Russian pianist and conductor Maxim Shostakovich, as well as mother of Gara Garayev - Sona Ahundova, children of the composer - People's Artist of Azerbaijan, composer Faraj Garayev and professor Zuleikha Garayeva-Bagirova. Having synthesized Eastern and Western musical traditions, his works cover essentially all genres. The works by Gara Garayev are performed all over the world. Garayev inherited his love of music from his parents. His father Abulfaz Garayev was a famous pediatrician in Baku. Abulfaz Garayev was known for his kindness and generosity. When patients were too poor to pay for treatment, he often left money under the prescription that he had written out for them. He knew Azerbaijani folk music very well and loved to sing. Garayev's mother, Sona Khanim, was among the first graduates of the Music School, the Baku branch of the Russian Music Society. At the age of eight, Garayev first entered the junior music school at the Azerbaijan State Conservatoire. His exceptional musical talents let him to study simultaneously in two faculties at the conservatoire. His teachers were Georgi Sharoyev, Leonid Rudolf, and the prominent Azerbaijani composer Uzeyir Hajibeyli. In 1938, Garayev composed his first musical piece, a cantata "The Song of the Heart" to the poem by Rasul Rza. It was performed in Moscow's Bolshoi Theater in the same year. He was only 20 years old at the time. Garayev returned to Baku in 1941. He began teaching students at Azerbaijan State Philharmonic Society. In 1945, both he and Jovdat Hajiyev wrote the "Motherland" opera, for which they were awarded a prestigious Stalin Prize. At the age of 30, Garayev was again awarded this prize for his symphonic poem "Leyli and Majnun", based on the same-titled famous work of Nizami Ganjavi. In 1952, under the direction of the choreographer P. A. Gusev, Garayev's "Seven Beauties" ballet was staged at the Azerbaijani Theater of Opera and Ballet. Based on Nizami Ganjavi's famous poem, "Seven Beauties", it became the first Azerbaijani ballet and opened a new chapter in the history of classical music of Azerbaijan. His ballet, "Path of Thunder", staged in 1958, was dedicated to racial conflicts in South Africa. In the same year, he wrote the score for the documentary film" A Story About the Oil Workers of the Caspian Sea", directed by Roman Karmen and set at the Oil Rocks. Through his life, Garayev wrote nearly 110 musical pieces, including ballets, operas, symphonic and chamber pieces, solos for piano, cantatas, songs and marches, and rose to prominence not only in Azerbaijan, but also worldwide. He brilliantly juxtaposed features of Mugham with jazz, blues, African music, European counterpoint styles, and developments related to the 20th century Western music such as the 12-tone technique. Garayev died on May 13, 1982 in Moscow at the age of 64. The composer has left a legacy of music that will be felt for generations to come. The memory of great composer will always live in the hearts of Azerbaijani people. President Ilham Aliyev signed an order on October 17 to mark the 100th jubilee of the legendary Azerbaijani composer. The Ministry of Culture and Tourism, the Ministry of Education and the Azerbaijan National Academy of Sciences, are tasked to prepare and execute an action plan for the jubilee in consideration of proposals of the Union of Composers.